The Lift Chair Store has assembled a collection of the finest lift chairs on the market and sells them at great prices. If you have any questions or comments, please give us a call. And remember, shipping is free on every liftchair we sell. To learn about the positive impact a lift chair can have on your life, please visit our Customer Resource Guide. Pride Mobility is the leading manufacturer of lift chairs in the world. Their years of experience in the industry allows them to provide customers with a wide array of quality liftchairs. Golden Technologies' lift chairs are built by craftsmen using the highest quality components. This means you get a liftchair that will serve you trouble-free for years to come. 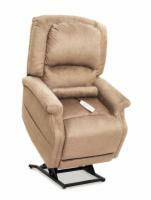 For the ultimate in affordability, comfort, and longevity of use, select an AmeriGlide lift recliner. Quickly narrow your lift chair search by using the form below. Check out our Lift Chair Positions Help section if are new to lift chair terminology. Check out all our Great Sales and sale details.